U.S. President Donald Trump raised tensions Thursday, refusing to back down and telling reporters that his threat to bring “fire and fury” on North Korea may not have gone far enough. The latest war of words came as North Korea derided Trump's warning as a “load of nonsense” and announced a detailed plan to launch missiles aimed at the waters off the coast of the U.S. Pacific territory of Guam. U of T News spoke with Tina Park, a history PhD candidate who focuses on Korean-Canadian relations, about the latest exchange between the two leaders and how to de-escalate the situation. “If the purpose of deterrence is to convince the adversary that the costs of aggression outweigh any benefits, President Trump's rhetoric is achieving the exact opposite – and such lack of strategy and prudence is dangerous and even reckless,” says Park, co-founder and executive director of the Canadian Centre for the Responsibility to Protect at U of T's Munk School of Global Affairs. Should we be worried? 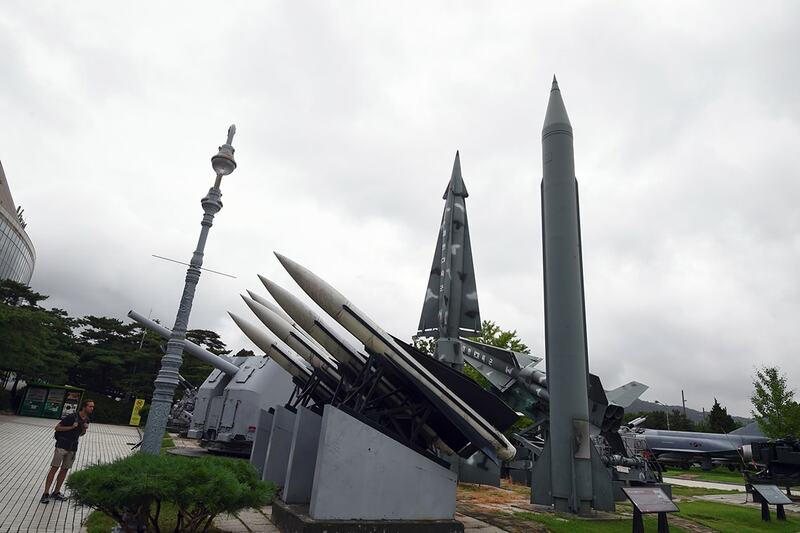 Is there a real threat that North Korea will launch missiles into Guam? Is Kim Jong-un capable of acting on impulse in a situation like this? We should be worried, not so much about the actual probabilities of a war breaking out on the Korean peninsula but the complete lack of a coherent policy on the part of the U.S. administration when it comes to dealing with North Korea. President Trump's use of rhetoric, which tends to be inconsistent, bellicose and mercurial in nature has only served to escalate the tensions between the U.S. and North Korea. Such hyperboles and an ad-hoc approach leave a lot of room for misinterpretation, and it harms the credibility of the United States, both in terms of how they are seen by Pyongyang and by the allies of the U.S.
We should also be concerned about the speed with which Pyongyang has advanced its military capabilities. From intercontinental ballistic missile to nuclear weapons to conventional weapons, North Korea is making significant improvements every month and every year. Ultimately, however, an actual attack on Guam or parts of the U.S. remains unlikely. The Korean peninsula is located at the geostrategic centre of Northeast Asia, with the highest concentration of military capabilities in the world and with neighbours like China, Japan and Russia who have vested interest in the political and economic stability of the two Koreas. There are some 28,500 U.S. troops stationed in Korea – the U.S. Forces Korea and the greater U.S. Pacific Command are all combat-ready, in addition to the Republic of Korea Armed Forces and its allies. The small size of the Korean peninsula also means that no surgical military option is viable, in terms of attacking any part of Korea. Is Trump’s strategy the right one in this situation? Is this just a war of words? He is speaking to a vary narrow group of supporters. This is the kind of rhetoric that appears in North Korea's propaganda materials. Such rhetoric essentially helps the North Korean regime to demonize the U.S. and justify its position about an existential threat from the U.S. If the purpose of deterrence is to convince the adversary that the costs of aggression outweigh any benefits, President Trump's rhetoric is achieving the exact opposite – and such lack of strategy and prudence is dangerous and even reckless. So while it is easy to dismiss North Korea as an irrational actor, it is important to actually confront the realities on the ground – and significant military capacities – and remember that any military confrontation will be extremely costly. It would be very helpful for the United States to have a coherent position and policy on North Korea and focus on de-escalating tension rather than sending mixed signals, which is what we have seen with President Trump's tweets. North Korea will feel compelled to retaliate if they are provoked. The old rule of diplomacy – that of saving face – is very important when it comes to dealing with North Korea. We found a way to use that premise with Iran on the nuclear question. Principles like inspection of a frozen nuclear programme in the North, in return for sanction relief, would be a good place to start. It would be helpful to send a high-level envoy from the UN or the U.S. administration and ultimately convene a talk amongst the key players in the region. If we are serious about changing North Korea's behaviour, dialogue and diplomacy will be the key, and we should be serious about offering real concessions in return for freezing North Korea's nuclear or missile developments. The new South Korean administration under President Moon Jae-In is very much committed to engaging with North Korea. Canada, as a country with a reputation for being an honest broker, also has an important role to play in terms of finding diplomatic solutions to the crisis with North Korea. While we are often preoccupied by North Korea's latest military developments, it is important to also remember the underlying humanitarian crisis unfolding in North Korea. Millions of people are dying from hunger and malnutrition, and there are crimes against humanity taking place under daylight. We have a collective responsibility to protect these people in peril who are suffering under the Kim regime, and there is so much more that the international community can do to provide humanitarian aid and speak up for ordinary people in North Korea.